Kong's ultralight Scarab is a multisport helmet with cutting-edge ventilation, best-in-show comfort, and reasonably low weight. The Scarab is EN-rated for climbing, kayaking, cycling, and equestrian use (though not skiing, apparently), allowing you to save money by using one Kong rather than a quiver of specialized, single-sport helmets. Multisport use aside, the Kong Scarab's signature quality is comfort. The Scarab truly delivers on the "you won't notice you're wearing it" pitch. 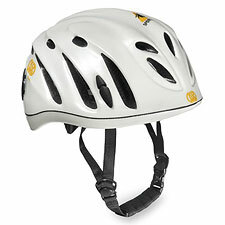 Weighing 9.6 ounces (measured), the Scarab is light but about an ounce heavier than the very lightest climbing helmets I've found. For that extra ounce, however, you get unquestionably the most comfortable helmet on the market. What makes the Scarab so comfy? Outstanding ventilation and ultra-soft interior straps and padding are part of the answer. The helmet also just seems to fit better than anything else I've tried. It comforms better to my head shape—especially compared to something like the CAMP Speed helmet. In terms of fit, the one-size-fits-all Kong is adjustable via a rear rotating dial. Additionally, the entire suspension can be raised or lowered as needed to customize the helmet to your head size. As for durability, the Scarab feels a tad more rugged than the Petzl Meteor III (especially the shell). You get four headlamp clips, plus an optional eyeshade as well. The Kong's styling reflects its use of venture-effect channels which funnel considerable amounts of air through the helmet. These channels make the Kong especially useful in warm climates. Foul weather climbers won't find the Kong's open design quite as delightful. Now available in white, red, and 'pearl black', the Scarab certainly has one of the more exotic looks of any modern climbing helmet. The big downside the Kong is its price: Italian styling and performance don't come cheap—call this the Ferrari of the helmet world. Then again, you can use the Kong for more than one sport, saving the cost of buying multiple helmets. Ultimately, I chose to use the Scarab as my main helmet primarily because of comfort. For those of us who just naturally hate to wear helmets, the Kong is subtle enough on the head to keep it from feeling annoyingly stuffy, hot, or heavy, greatly increasing the chances you'll be wearing it when you need it.